My good friend and former riding buddy Chad Hubbard quit racing due to cost and the fact that he wasn’t having fun anymore. Then Chad came to me one day in a pickle. 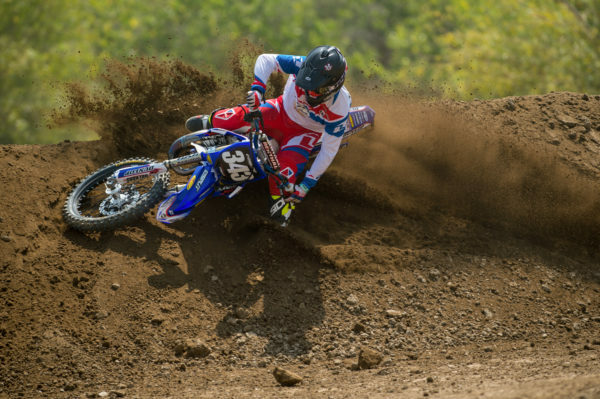 He explained that his son 14 year-old, Cayden, wanted to start riding for fun again. Rather than race, they wanted to stick to practice days at the track and trips out to the desert. His dilemma was that he didn’t want to spend $16,000 on two new bikes, but at the same time, he didn’t want him or his son on a worn out old bike that could cause them problems. Luckily, I had the answer he was looking for. We could build two awesome bikes for a relatively low cost that would not only look cool, but would perform great as well. My idea was to find two older Yamaha two-strokes, tear them down to the frame, and rebuild them from the ground up. Unfortunately finding an older 2006-08 YZ isn’t as easy as one might think. In the end, it took about a month before we found a Yamaha YZ125 and YZ250 that were worth rebuilding for Chad and Cayden. 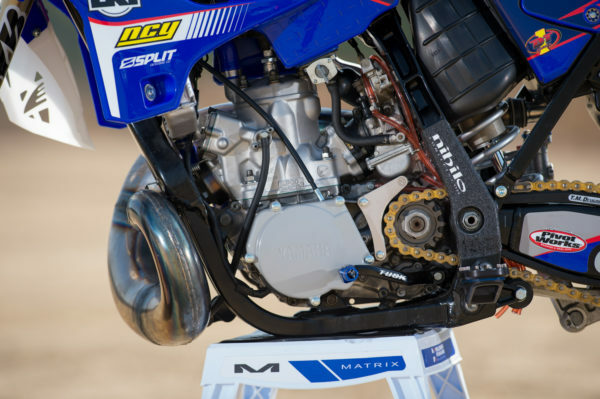 Yamaha’s two-strokes haven’t changed all that much in the last 11 years, which meant getting the help and the parts to get these bikes going was an easy task. Once we got the bikes, we stripped them down to the frame and that’s when the work really started adding up! The hardware was mismatched on both bikes, we were missing a lot of parts, and the motors weren’t in good shape. The further we got into this project, the more it became very sentimental for me. 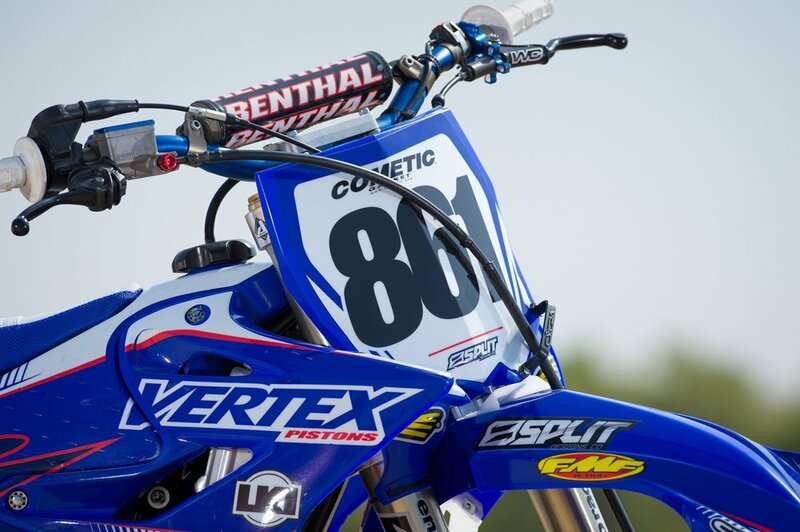 I grew up racing for North County Yamaha on two strokes with my late brother Cole and other close friends. Those memories were flooding back to me as we tore into the bikes that I knew all too well. That’s when I realized this would be a great opportunity to get some of those close friends back into riding on some bikes that I knew a lot about. I reached out to Jay Clark, who does a lot of custom refurbished bikes, to go through the engines. Jay explained that a Wrench Rabbit kit would be the best solution for repairing the worn out motors. Wrench Rabbit is a complete kit that includes everything needed to rebuild almost any motor, as opposed to collecting each piece of the puzzle individually. This was right up our alley, and it saved a lot of money as well. We then reached out to Tom Morgan to do the cylinder and heads on these bikes. Tom used to do my motors on my bikes in the late 90’s and they were absolute rockets! With more power, we needed a stronger clutch system, and there is no better clutch than a Hinson. Hinson supplied both bikes a complete clutch kit to control the extra power we got out of the bikes. With more power comes more heat, so the bent up radiators were shipped out to ICW for a complete overhaul. DT1 Filters and FMF helped these bikes breathe with filters and exhausts. We then turned to working on the chassis. 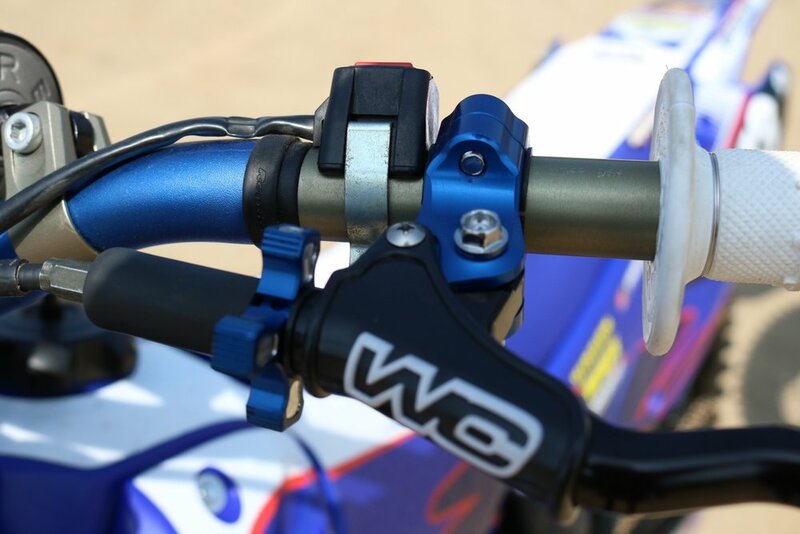 The YZ’s use KYB components and there is only one choice when it comes to KYB suspension, Enzo Racing. We took both sets of suspension over to Enzo for a complete overhaul. The standard triple clamps are nothing special on these bikes so we used Applied Racing’s top and bottom clamps. The frames and swing arms were pretty beat up, so we decided to contact Chad Johnson at San Diego Powder Coat. They powder coated the entire chassis semi gloss black and it couldn’t have turned out any better. Now the frames were looking good, but all of the bearings were trashed. To solve that problem, we used Pivot Works to replace every bearing on the bike. We didn’t stop there either. Hinson akadized the brake calipers, Motion Pro got us new brake lines, throttle cables, and rim locks, and Nihilo provided us anodized banjo bolts. 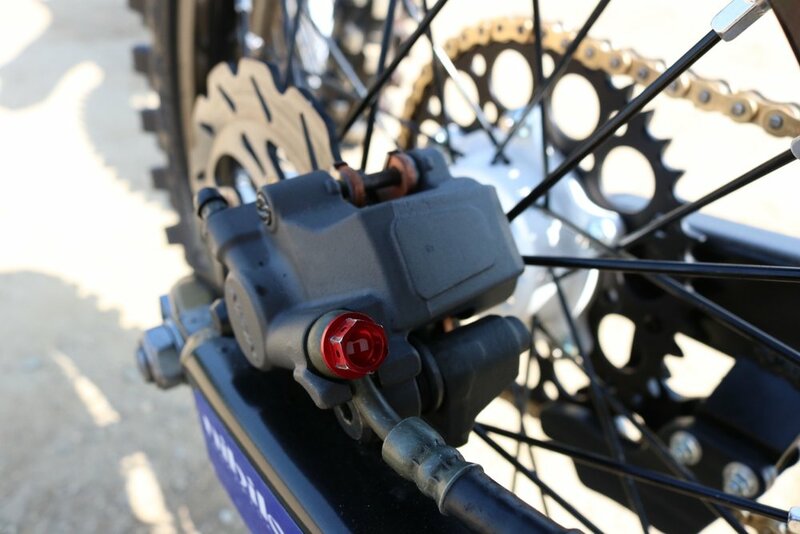 The standard Yamaha clutch perch leaves room to be desired, so Works Connection supplied us with a quick adjust clutch, along an hour meter and bling for the master cylinders and chain blocks. They even supplied their holeshot devices. Clearly, the pegs were worn, so we had Fasst Company supply us with their latest anti-vibration pegs, a rear brake spring, and anti-vibration inserts for our Renthal Twinwall handlebars. 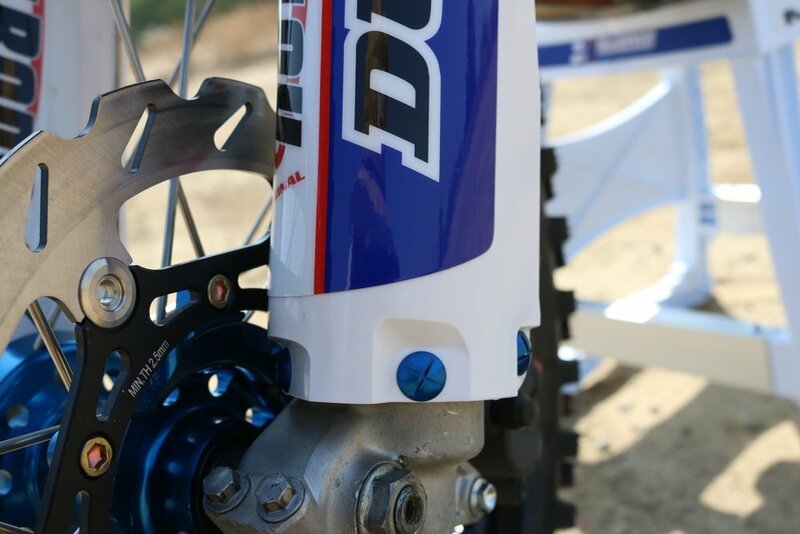 Tusk Racing stepped up in a big way with two complete sets of wheels, along with brake pedals and shift levers. These looked great with our black frame and other anodized pieces. When it comes to tires you can’t go wrong with Dunlop tires. We used Dunlop MX3’s front and rear. 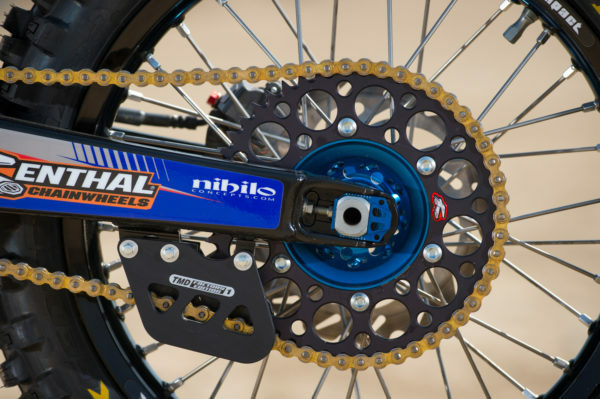 We went with Renthal chains and sprockets for the performance and looks they provide. We chose to stick to the stock gearing on both the 125 and the 250. All that was left now were the plastic and graphics. We wanted to make sure we gave everyone the proper credit they deserved for supporting this project, while making sure they looked as clean as everything else. Cycra, Split Designs, and Motoseat got us handled with all of our needs, and the final product turned out absolutely stunning. I asked Chad if he would mind running my younger brothers number 343 and Donovan Mitchell’s 861 on the 250. Donovan was my NCY teammate who was tragically paralyzed after signing a Factory KTM contract in 1999. One afternoon I took a step back in Chad’s garage and was overcome with joy to see Chad’s son Cayden helping in whatever way he could to get his 125 going. He didn’t ask for a bike like this, but you could tell he was learning a ton and loving the experience of building his own bike with his Dad. Moments like these have been lost with all of the technology that comes on modern four-strokes. It was great to save money on these project bikes, but the memories being made were priceless. These bikes have meaning! They are easy to work on and they look and perform awesome. Most importantly, a father and his son built them.